Alzheimer’s disease (AD) is characterized by a progressive loss of memory and cognitive function as well as behavioral and sleep disturbances including insomnia. The pathophysiology of AD has been attributed to oxidative stress-induced amyloid β-protein (Aβ) deposition. Abnormal tau protein, mitochondrial dysfunction, and protein hyperphosphorylation have been demonstrated in neural tissues of AD patients. AD patients exhibit severe sleep-wake disturbances associated with rapid cognitive decline and memory impairment. Optimally effective management of AD patients requires a drug that can arrest Aβ-induced neurotoxic effects and restore the disturbed sleep-wake rhythm with improvement in sleep quality. In this context, the pineal hormone melatonin has been demonstrated to be an effective antioxidant that can prevent Aβ-induced neurotoxic effects through a variety of mechanisms. Sleep deprivation itself produces oxidative damage, impaired mitochondrial function, neurodegenerative inflammation, altered proteosomal processing, and abnormal activation of enzymes. Treating sleep disturbances is also necessary for preventing and arresting AD progression. 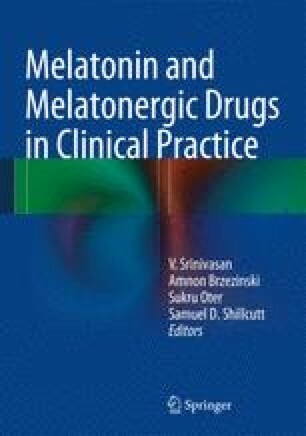 Besides melatonin, use of melatonergic agonists such as ramelteon, agomelatine, and tasimelteon, which are now used clinically for treating insomnia and other sleep disorders, may also be beneficial in treating AD.